Free a-squared Anti-Malware Download from FilesPack.com! Protects the PC against malicious software: Trojans, Viruses, Worms and Spyware. 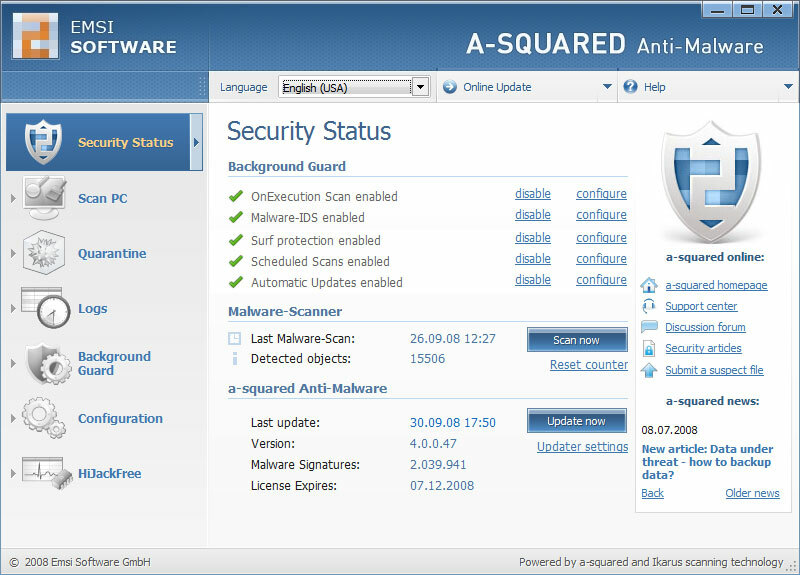 a-squared Anti-Malware protects your PC from Malware-based hacker attacks. Its special capabilities in dealing with Trojans, Viruses, Worms, Dialers, Adware and Spyware make it an indispensable enhancement to any protection system, whether on a private PC or a company network. Not just any scanners, but a combination of two world class products - the a-squared Anti-Spyware, and the Ikarus Anti-Virus engine. Latest tests approve that both are cutting edge in Malware detection. No doubling of the scan duration as it would be the case with two separate scanning programs. Considerable performance improvement is possible thanks to the integration of the two engines on the lowest level. No double price - two top security products at the price of one. Unlike conventional protection systems a-squared Anti-Malware does not only check signatures for known Malware patterns before starting a program, but it also constantly monitors the behavior of all active programs and raises an alarm as soon as something suspicious happens. Typical ways of infection are disabled in advance. Websites that try to plant Trojans or Spyware or that offer deceptive contents are blocked by the surfing protection. When a Malware infection is detected, the automatic scan puts the found objects under quarantine or deletes them finally. Anti-Malware holds plenty of advanced options for experts to detect and delete Malware manually. For this purpose the integrated system analysis tool HiJackFree is included. You can free download a-squared Anti-Malware 4.0.0.50 now. Added a second antivirus scan engine to improve detection quality. The a-squared engine was improved too: it loads 57% faster, uses 30% less RAM and scans 4% faster than v3.x. A new surf protection feature has been added too to block malicious, tracking and phishing websites.